Researchers at Johns Hopkins Kimmel Cancer Center report that in a genome-sequencing study of pancreatic cancers and blood in 101 patients at least one-third of the patients' tumors have genetic mutations that may someday help guide precision therapy of their disease. Results of blood tests to detect DNA shed from tumors, they add, also predicted cancer recurrence more than half a year earlier than standard imaging methods. “Pancreatic cancer has one of the highest death rates among cancer types. Many people think there are no treatment options, but our study shows that genomic sequencing of patients' tumor samples may identify mutations that match the target of certain clinical trials or drugs that are more precisely appropriate for these patients,” points out Victor Velculescu, M.D., Ph.D., a professor of oncology and pathology at the Johns Hopkins University School of Medicine and co-director of the Kimmel Cancer Center's Cancer Biology Program. Dr. Velculescu cautions that for patients to realize the treatment-guiding benefit of genomic sequencing, researchers will first need to develop larger, multi-institutional trials using experimental or approved drugs that target the mutations identified by the Johns Hopkins-led team. Currently, pancreatic cancer is treated surgically, and with radiation and chemotherapy. Results of their sequencing study (“Clinical implications of genomic alterations in the tumour and circulation of pancreatic cancer patients”), using data generated by Personal Genome Diagnostics, a company co-founded by the Johns Hopkins researchers, are published online in Nature Communications. Pancreatic cancers are diagnosed in nearly 50,000 people in the U.S. each year. Fewer than 10% of them survive more than five years past diagnosis, and most patients are prescribed therapies based on their disease stage, not the genomic qualities of their cancer. For the sequencing study, Dr. Velculescu and his colleagues collected tumor samples and normal DNA from 101 patients with stage II pancreatic cancer whose tumors were surgically removed at the University of Pennsylvania, the University of Copenhagen and Washington University at St. Louis. The team sequenced the whole exomes of 24 of the 101 patients' tumor and normal DNA to find genes that drive the cancer's growth and were commonly mutated among the group. Then, the group sequenced tumor and normal DNA in the rest of the patients, specifically looking for mutations in a subset of cancer-promoting genes. Pancreatic cancer tissue is often difficult to sequence, and mutations are challenging to find, says co-author Mark Sausen, Ph.D., a former graduate student in Dr. Velculescu's laboratory when the research was completed and who is now employed by Personal Genome Diagnostics. To overcome this, the team used sensitive deep sequencing methods that analyzed each nucleotide base more than 750 times to identify mutated genes. 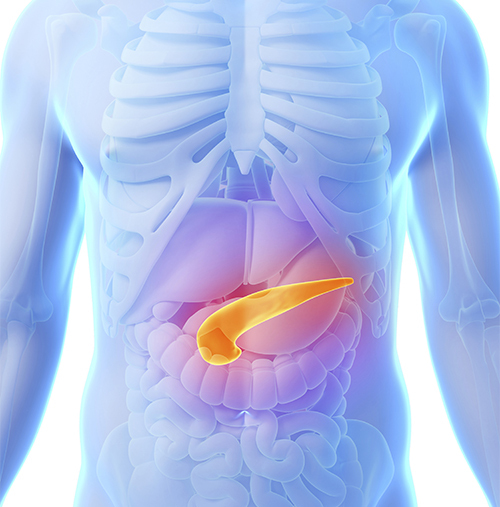 The team reported that 98 of the 101 patients had tumor mutations in known pancreatic cancer genes, TP53 and KRAS. So far, Dr. Sausen says, drugs that target these two mutations have had disappointing results. However, the study identified 38 patients with mutations in genes such as ERBB2, PI3KCA, BRCA2, AKT1 and AKT2 that are the focus of drugs already approved for other diseases, or of ongoing or published clinical trials. Dr. Velculescu says previously published research by Johns Hopkins scientists provided proof of principle of the potential value of drug therapies precisely selected for their ability to address specific cancer mutations. They sequenced the tumor of a patient with pancreatic cancer and found mutations in the PALB2 gene, which is involved in repairing DNA damage. When physicians treated the patient with mitomycin C, a DNA-damaging drug, the patient survived more than five years past diagnosis, well beyond average survival estimates. In further experiments, the scientists collected blood samples every three months from 51 patients with early-stage pancreatic cancer (44 of the 101 subjects who were sequenced in the current study plus seven additional patients) for up to three years. Some 22 of the 51 (43%) had detectable levels of cancer DNA in their blood at the time of their diagnosis. Furthermore, the scientists predicted patients' cancer recurrence after surgery six months earlier by looking for cancer DNA shed into the blood, compared with standard imaging. He says that larger clinical trials are also needed to determine the clinical effectiveness of the blood-based DNA tests.